Il miglior software di Analisi e Grafica scientifica per Ricercatori e Professionisti! I ricercatori necessitano di strumenti di analisi e di grafica molto potenti e intuitivi che possano interagire con i loro dati e creare report personalizzati. Origin include una serie di caratteristiche che soddisfano al meglio le necessità sia di scienziati che di ingegneri; i File di lavoro a fogli multipli, la pubblicazione di grafici di grande qualità e gli strumenti di analisi standardizzati forniscono un solido e integrato ambiente software per importare, esplorare e analizzare dati, creare e modificare grafici e pubblicare il proprio lavoro. Origin Professional contiene tutte le caratteristiche di Origin Standard più estesi strumenti di analisi per la statistica, 3D, processamento di immagini e di segnale. OriginPro offre una tale potenza analitica che chiunque abbia bisogno di una integrata soluzione per l’analisi dati e la grafica non potrà fare a meno di sceglierlo. Acquista oggi Origin 2019 e riceverai gratuitamente la nuova versione 2019 b.
OriginLab offre speciali pacchetti di licenze per le istituzioni Accademiche. Visit the Origin vs. OriginPro page to view a comparison table. f you are upgrading from a previous version, visit our Top Features page to see what's new in the latest version, or browse our Key Features by Version page. A *Start Menu* button has been added to the bottom left corner of the Origin interface. Search can be customized in a Settings dialog accessible from the icon next to the edit box. Search results can include Menu items, Apps, X-Functions, Help files, Videos, Sample Project files. Search can also look for your recently-opened Origin project files, or project files in folders where you recently opened projects. 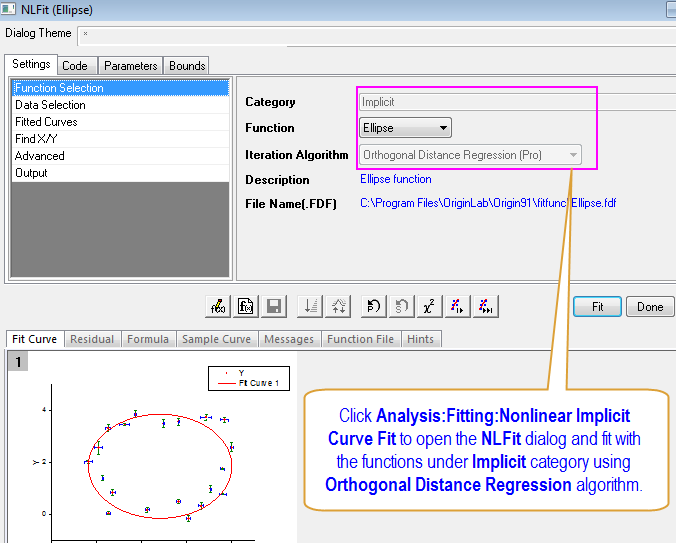 Search results will display a tooltip with more information, as well as a preview of graphs in the case of Sample Projects that are installed with Origin. Menu items, Apps and X-Functions are launched directly when you click on search results. Select one or more points in a graph and highlight data in other graphs plotted from the same worksheet rows. Select one or more rows in worksheet and corresponding points in all graphs will be highlighted. Simultaneously highlights corresponding worksheet rows and fades unselected rows. On quitting the tool, worksheet rows remain selected. You can further process these rows by copying to a new sheet, masking row data, etc. Data point tooltip can be customized to show values from other columns or meta data elements. Settings can be saved as theme or with graph page. Set background or text color of worksheet cells using custom rules, or create a heatmap; or simply color duplicate values in the worksheet . The cell colors will update when data changes. A Conditional Format Manager dialog is provided to manage, and update multiple formats in a worksheet.. Conditional formatting using a heatmap. Cell text color is set to have auto contrast. Open your own custom templates from the User Templates tab. Select a built-in or user-created template. Optionally set desired template as default for new books and projects. Construct a new book with desired columns and designations. Toggle between default column view and the new Column List view for worksheets. In the new Column List view, only the metadata properties are displayed, and the data columns are listed vertically. This facilitates working with a very large number of columns. Hovering on the left most end of the list entry of each column displays the first five data elements in that column for quick reference of the data. The rows in the list entry behave same way as columns in the default worksheet view. You can select multiple rows from the list view and create plots and perform any operations available for worksheet columns such as smoothing or curve fitting. Use CTRL+W to toggle between default view and a new Column List view for worksheets. The new view shows a compact list of columns, where only metadata properties are displayed. Hovering on the left most entry of a row in the list displays the first five data points from that column. Handling of empty worksheet cells has been improved in this version. Empty cells with missing values are displayed as visually empty with a white background. Cells that are unused, as in no data was ever entered, are displayed with a darker background. The new Graph Maker App provides an interactive way of exploring relationships between multiple variables. Use categorical or numeric data from other columns to assign symbol color, symbol type etc. Row-wise data plotted as a grouped line and symbol plot. More Custom Formats for Numeric Data including DMS, π, direct display of Hex Values. Define Image Preview for Graph or Book Templates, incl. Analysis Templates. Project Explorer Improvements: Name Folder when creating, Show Folders toggle in bottom panel. Clickable Spreadsheet Cell Notation (SCN) button to toggle SCN On or Off. Object Manager: More data manipulation options incl. Move Plot(s) to Other Layer, Remove Plot from Group and dragging to reorder or move plots. More Box Chart customizations incl. Vertical Auto Position of Labels, show Median. Outlier tab added to Plot Details for outlier customization. User Parameter Row support for Numeric, Date, Time formatting, Row Formulas. Copy and Paste Filter Condition to other Worksheet Columns. Block Recalculation of Individual Operations to speed workflow. Set Node Expand/Collapse default configuration in Hierarchical Result Sheet. Better Batch Processing of Multiple Files in Analysis Template, incl. preservation of Reference Sheet data. Add Sparklines Toolbar button added to Columns Toolbar. Output Highlighted Rows in the Worksheet to a New Sheet. Import Dialog Theme Improvements to clarify use of import filters: Drag and Drop, Save to <Sheet>. Alternate Date-Time counting systems, including a "2018" system with microsecond support. CTRL + G hotkey opens Graph Export dialog with the <last used> export settings loaded. Import Wizard OC Source File Support for Apps Folder, User-defined Data Type. Excel: Improvements to "Replace Existing Data" import mode. Excel: Updated import library for support of the latest Excel formats. These system requirements apply to the most recent release of Origin and OriginPro (both 32-bit and 64-bit versions). †Note: Windows 10 users are strongly urged to obtain the latest updates, particularly if you applied Microsoft's Fall Creator's Update 1709. For more information, see this OriginLab K-Base Item. Mac users can run Origin by using Microsoft Windows® via Boot Camp or within OS X using third-party virtual machine software.